I Had My First Crash. What Did I Do Wrong? I just got into my first crash and I would like some advice. I only started riding a few months ago and I’d like to understand what I did wrong. I was riding in the city when the car in front of me hit the brakes. I had to brake very hard and I think I hit the front brake first. The ground was wet so my rear wheel slipped and I ended up falling with my bike. I ride on a 2003 Kawasaki Ninja 250 and it doesn’t have the ABS; could that have made a difference? How do I know when to use the front or the rear brake? First off, thanks for reaching out and welcome to the big motorcycle family. Sorry to hear you already had your first close call, but good on you for wanting to understand what could have been done differently. I obviously wasn't there when the incident happened, but here's my two cent. If you had to perform an emergency braking maneuvre while riding in the city, this means you were all up in the driver in front of you’s business. Back off. Keep a safe distance from the vehicle in front of you. Use the 3-second rule to help you gauge your safe distance: choose a landmark on the side of the road and start counting Mississippis from the moment the car in front of you drives past the landmark, up to the moment you do as well: you should at least have enough time to count to 3. The more distance you keep from the car in front of you, the more time you have react when something goes wrong. If the vehicle in front of you is a truck or a van and you can’t see in front of it, give yourself more space. If you’re on the highway riding at higher speeds, give yourself more space. If the road is wet, give yourself more space. From the looks of it, you also probably hit the rear brake too hard which locked the wheel. When you brake, all the weight transfers to the front of the bike, which means the rear wheel loses traction and slides more easily. The effect is obviously exacerbated if the asphalt is wet. 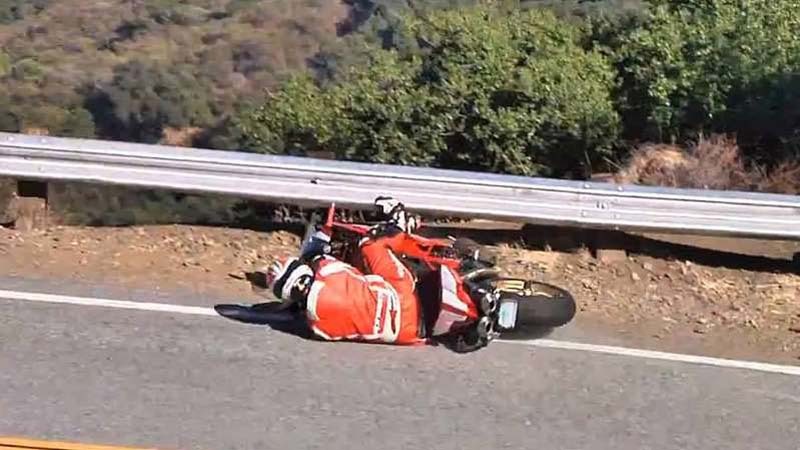 If you know your bike well enough, and know how to react, a skid doesn’t automatically mean a fall, but it's a skill that requires practice. As to whether you should use the front or the back brake, I actually don’t have a specific answer to that. The thing is, recommendations tend to vary. Some say the front brake is your safest bet as it provides most of the bike’s braking power, but apply it too aggressively and you nose dive or lose control of the front of the bike which, trust me, is a lot worst than losing control of the back. Others actually believe that you should apply the rear brake as hard as you can and that you’re better off skidding than hitting the car in front of you. You can (and should) actually practice emergency braking in an empty parking lot and get acquainted with how your bike reacts. This will give you more confidence and trust in your bike's ability next time you're in an emergency situation. With a more recent bike, the ABS would have kept the rear wheel from locking, which in turn might have helped you be more in control of the bike. In the end, it all comes down to gaining experience on your bike, understanding what it can and cannot do, and developing good habits that are specific to your riding style and to the type of bike you have. The better you understand your bike’s behavior in different situations, the better equipped you will be to face the unpredictable. And remember, it might sound like nagging, but keep your safe distance: that simple step will save you a lot of trouble. For all the rest, practice makes perfect. Autos - U.S. Daily News: I Had My First Crash. What Did I Do Wrong?